Along with the ability to freeze a singular moment in time, photographers can choose to compress lengths of time down to a single image, encompassing changes in light, shape, form or position. We can use this as a tool in shaping our images, or simply let the subject’s own movement dictate the outcome through chance. These special effects are accessible to any photographer with manual controls on their camera and the patience to wait out the duration of the open shutter. Long exposure (LE) techniques are best used for compositions that combine both static and moving subjects, like the flow of water over rocks, the wind-blown cloud formations over a mountain range, or even in urban settings where moving people or cars are set against the streets, signs and storefronts. Some of the best long-exposures juxtapose these elements to create surreal or fantastic scenes never imagined. The best tool for achieving LE effects in any lighting condition is a Neutral Density (ND) filter—a glass optic that blocks a certain amount of light, allowing for longer shutter speeds at a given aperture. Using appropriate amounts of ND filtration, it is possible to shoot minute-long exposures in full daylight. ND filters are available in a range of values that can stack to add density, and also in variable or gradient styles. The best ND filters will be completely color neutral so as not to affect the white balance of your image. 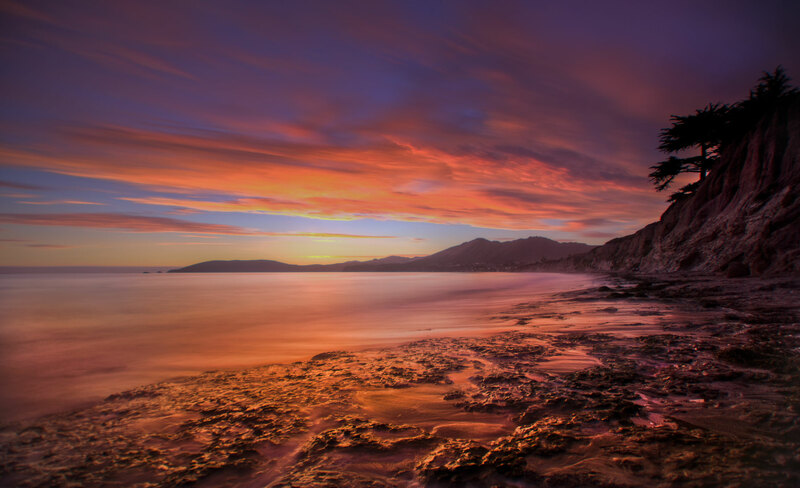 Plan your composition before mounting your filters—you may not be able to see through them. Use manual focus to maintain accuracy—ND filters will cut out too much light to allow for auto-focusing. Use presets or Kelvin scale white-balance settings to maintain accurate color and to offset any possible color shifts from your filter. Shoot in manual exposure mode for control over your motion blur and depth of field. Use a solid tripod, like our TVC-33, and maximize stability by adding weight from the built-in weight hook or by leaning vertically down on the legs. Outfit your tripod with foot spikes, like our TA-3-FS Foot Spikes, for additional lateral support against wind or water on sand, gravel and river rock. Drive them as deep as you can to maximize their effect. Use a lens hood or “flag” the front glass surface to minimize flare and ghosting—serious issues that can arise when using one or more filters. To avoid camera shake during exposures, use a cable or wireless shutter-release—this is especially necessary when your desired shutter speed is over 30sec, forcing you to shoot in “Bulb” mode. Give each exposure a few tries—blurred subject matter will look slightly different each time. Be patient and time your release to capture the lead up and climax of the action. You can also combine your LE techniques and shoot an HDR series — blurred water overlays will compound the “fog”, creating a rich layered effect. Thanks for the tips, I always want to try LE’s but I am hopeless at calculating fractions hehe, so I don’t know how to work out if it was say 1/250 without the 10 stop what it would be with a 10 stop. Actually, I tend to avoid maths as well when it comes to my long exposure calculations. You only need to remember one simple principle: 1-stop of light more means your shutter speed gets 2x longer. In actual application, you can simply count the clicks on your shutter speed dial. Most cameras these days have options for setting that with 1/2-stop or 1/3-stop increments (I use 1/3-stop for finer control). So all I do is count in multiples of 3 after adding my ND filter, and make sure to go in the right direction. For example, lets say my shot is metered at f/11 for 1/250th, and I’ll be adding my 10-stop filter. I’d just click my shutter dial 30 times in the “slower” direction, which brings me to a shutter speed of 4 seconds (4″). If I’m trying to get a shot with a targeted shutter speed (i.e. I know I want to expose for 1 minute) then I would simply reverse the thinking and just ask, “how many stops of ND do I need to add to get to 1 minute from whatever the scene is metering at?” The answer is just a few clicks (and counts) away. Can you advise how to prep tripods, foot spikes and ball heads, prior to shooting – e.g. silicone spray? What about after a day’s shooting in salt water – wrinse in fresh water followed by a squirt of WD-40? The best prep before shooting is actually maintaining your equipment post shooting. We’ll work up a post on cleaning tripod legs for proper procedure. The tripod tubes should NEVER be lubed. Doing so will potentially lower the load capacity of the tripod and end up getting whatever you use all over your hands and gear. Don’t want anything sliding or leaving smudges! Also, we have some videos on tripod use: http://reallyrightstuff.com/WebsiteInfo.aspx?fc=58 — the ‘Dirt Prevention’ tip is great for shooting in the muck.